Recently I decided I needed to eat more vegetables (yes, this is something I should have decided long ago, but now I am trying really hard.) So, I went to Costco and bought a massive bag of broccoli, 6 large red peppers and a huge bag of carrots. I have a bag of onions, a 1/2 bag of potatoes and 3 sweet potatoes left over from Thanksgiving. I just found this nifty roasting guide here and below. I'm definately going to try some of these combinations out soon. Preheat oven to 400°F. Spray jelly roll pan with cooking spray. Combine vegetable mixture (either hard or soft vegetables) in bowl. Add your choice of seasoning mix. Toss vegetables to coat with seasoning. Place vegetables in pan in a single layer. For soft vegetables: Roast 10 minutes. 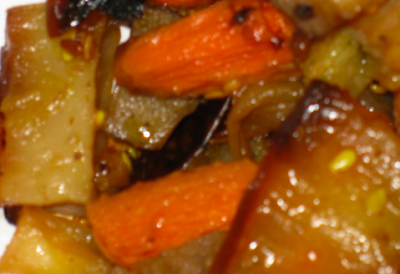 Take pan out of oven and spray the tops of the vegetables with cooking spray. Turn veggies and cook for another 5 to 10 minutes or until vegetables are tender. For hard vegetables: Roast 15 minutes. Take pan out of oven and spray the tops of the vegetables with cooking spray. Turn veggies and cook for another 15 minutes or until vegetables are tender. Make it a meal by adding a can of drained and rinsed beans (such as garbanzo or black beans). Serve vegetables as a side dish, over couscous or brown rice, or wrapped up in a burrito with salsa. Recipe from PCRM Weight Loss Study Cooking Demonstration contributed by Brie Turner-McGrievy, R.D.